It's More Than Just a Dog Show, It's An Experience. sure to excite & delight ANY audience! Our All-Inclusive Shows Can Be Adapted for Any Sized Venue or Event! Whether it's a county fair, festival, theme park or anything else in between, we can customize our shows to match your venue and audience. Looking for in-game fun that'll be sure to get the crowd going? Our sporting acts are some of the most popular in the Midwest! Create an experience no one will forget at your next special event! Our canines are guaranteed to provide any audience with memories that'll last forever. Our shows combine audience interaction, unbelievable pet tricks, exciting music and some ridiculously cute pups to create a unique, engaging experience any audience will love. Our team of world-class handlers and awe-inspiring canine athletes perform across Ohio and the Midwest! No show is too big or too small for Team Zoom Canine Entertainment! We customize each performance, tailoring our outfits, music and choreographed routines to match any event's theme! Tons of excitement and fun! Our action-packed shows feature our dogs performing amazing, advanced stunts to upbeat music that will have any crowd roaring! Team Zoom Dogs Will Do Anything for Fun! 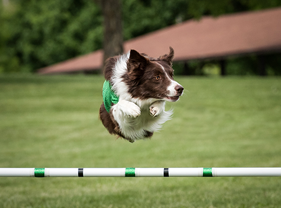 From flying through the air to catch a frisbee disc, to showing off agility skills by darting through an obstacle course, our canine athletes perform the most amazing tricks. 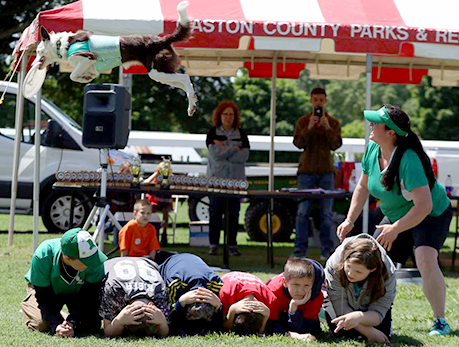 Our stunt dogs love to get the crowd involved as well, so get ready for you and your guests to be a part of the show with spectator games! Team Zoom performs at a variety of venues including sporting events, festivals, charity functions, state fairs, county fairs, children's birthday parties and everything in between! To learn more about our shows and to check availability, contact us today at (937) 607-4594!